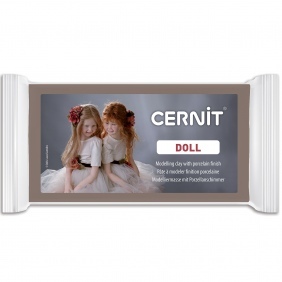 For the creation of dolls entirely in Cernit, the finish of the Doll range is ideal. Once baked, it has a skin-look colour. Cernit Glamour clay colours contain very fine mica flakes. The rendering is pearly, very nice for your jewelry made with polymer clay! Create your jewelry by giving them a metallic look with Cernit Metallic clay! By small pieces or as main piece, these colours have a beautiful rendering! Cernit is a modelling polymer clay that contains PVC and plasticizer. Polymerising happens during baking. The clay hardens. Polymer clay can be used from 8 years. It is liked for making decorative items such as jewellery (earrings, bracelets, pendants...), figurines, accessories, miniature food or even for customisation and restoration of furnitures. Children as well as adults or professionnal artisans or jewellery makers use this polymer clay. The large colour range allows begins and more experienced users to vary shades without having to mix colours. Cernit Number one : 42 opaque colours, glossy after polishing. Available in 56, 250 or 500g. Cernit Porcelaine : 14 colours with a porcelain-like finish. Available in 56g. Cernit Glamour : 7 pearlescent colours in pieces of 56g. 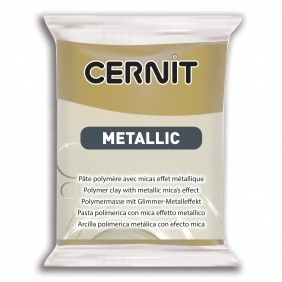 Cernit Metallic : 7 metallic colours in pieces of 56g. Cernit Translucent : 14 transparent colours and one night glowing colour. This range is very popular among the artists due to its amazing transparency. Available in 56, 250 ou 500g. Cernit Neon : The most neon of all polymer clays, 4 colours available in 56g ! Cernit Nature : 3 colours with a stone and dirt effect thanks to strands in the clay that allows an irregular aspect, similar to the one of a stone. Available in pieces of 56g. 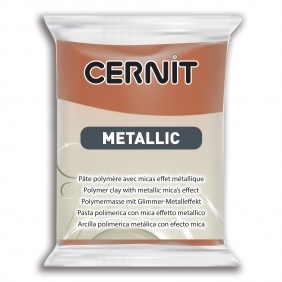 Cernit Shiny : 14 colours in 56g, highly concentrated in coloured mica that contrast with the colours of the clay. The shiny is different from the glamour due to the thinness of the glitter in it and the colours effects. These colours are perfect for jewellery as they have a pretty metallic effect together with coloured hints. 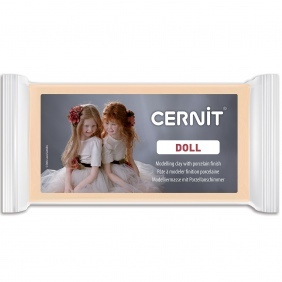 Cernit Doll : 7 colours that have a skin-like effect (slightly transparent) and one translucent flesh colour. This clay has an aspect very close to flesh, a porcelain-like finish and is totally suitable for creating dolls. Each piece weighs 500g. Cernit Soft Mix : a clay softener that does no change the colour of the clay. You can mix up to a third of softener with 2/3rd of polymer clay Cernit. This way, the clay will be easier to work with and softer. The plasticity of the clay is increased. 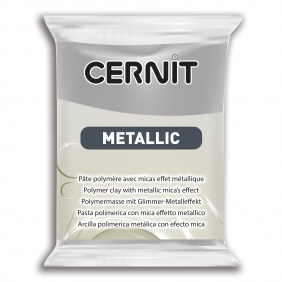 How to use polymer clay Cernit ? Once unpacked, the clay has to be kneaded in the palm of the hand before starting modelling so that it goes softer and easier to work with. The clay should be used with clean hands on a clean surface as well to prevent any dirt or dust to get in the clay. How to bake polymer clay Cernit ? The Cernit clay polymerises between 110 and 130°C (230-266°F) in a preheated oven. Baking time is of 30 minutes. Temperature should be respected unless harmful gases could develop and the colour could be corrupted. Be careful, this clay cannot be baked in a microwave oven! After baking, the clay is waterproof. Also, it can be baked several times if you wish to add bits to your work. When you are done baking, the clay can still be worked with. It can be sanded, drilled, varnished according to the finish you like. For polishing, start with sanding gently the clay with a fine-grain sandpaper. Finish with a polisher to get a maximum glossy effect. After some time, if it rubs clothing the clay could loose some of the glossy. Then, it has to be polished again. The result will be the same as with varnish. However, varnish will resist the rubbing and does not need to be applied again. As soon as your piece of clay is baked and maybe polished, you can still work on it by adding acrylic paints, oil paints, mica powders or varnish. How to store polymer clay Cernit ? 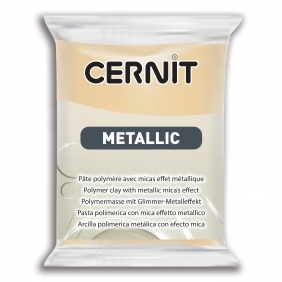 Once the packaging is open, Cernit can be stored in that same package or in a plastic wrap, to the ambient temperature. You can keep it like that up to 3 months. 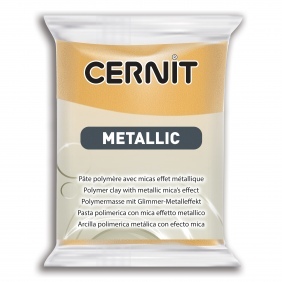 Our Cernit does not contain any phtalates. Children should not be left without a watch while using the clay. This product must not be put in the mouth and we advise to wash hands after each use. One should not eat, dring or smoke in an area which is dedicted to modelling Cernit. The cernit clay is produced in our factory in Wandre, Belgium.